ScoreHero :: View topic - 11/2 DLC: Stroke 9, Finger Eleven, The Shins, Jeff Williams! 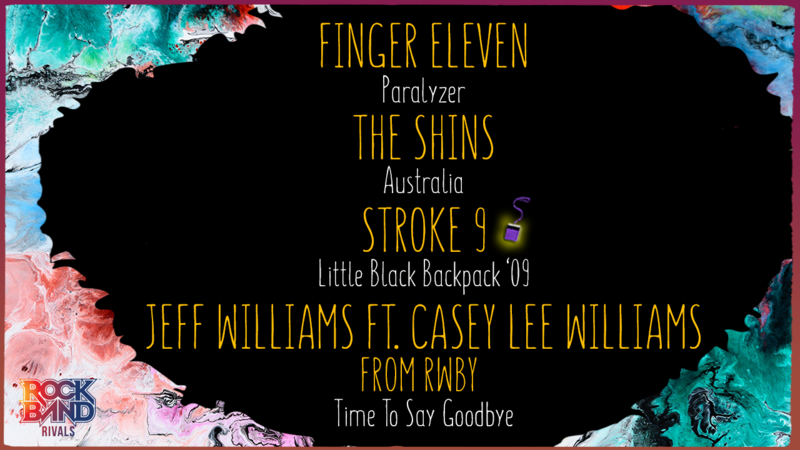 11/2 DLC: Stroke 9, Finger Eleven, The Shins, Jeff Williams! Posted: Fri Nov 02, 2018 10:17 pm Post subject: 11/2 DLC: Stroke 9, Finger Eleven, The Shins, Jeff Williams! Its a week for everyone, as weve got DLC by Finger Eleven, The Shins, AND Stroke 9, along with the next RWBY track from our good friends over at Rooster Teeth! Finger Eleven kicks the week off with Paralyzer, a well-known hit from the 00s. The widely recognizable guitar riff makes it a perfect song for Rock Band 4. A single off the bands fifth album Them vs. You vs. Me, it became the bands biggest hit and remains a staple in their live sets. Guitar is as fun as youd expect, with HOPO strings going immediately into quick chords, so youve got to bring your best performance. Drums are tough, with simple beats filled with hi-hat flourishes and snare rolls that start with your off-hand. Before the guitar solo, theres even a breakdown that asks for precision on the snare, hi-hat, and kick. This week, The Shins song Australia joins their previously released track New Slang in the Rock Band library. The bands third album, Wincing the Night Away, was critically acclaimed upon release in 2007 and was nominated for a Best Alternative Music Album Grammy the following year. A great example of dreamy indie rock, Australia has a pleasant sound set down by the instruments. Bass holds a nice groove, rarely playing the same note back-to-back, while guitar quickly hops between chord patterns and quick jumps around single notes. Drums are largely held down by the snare and kick, but youll get some great sticking practice with the fills that regularly appear. Weve also got Little Black Backpack 09, a re-record of the 90s staple from Stroke 9. The song was a single from their major label debut Nasty Little Thoughts and would go to become one of their signature tracks. This version was specifically created for music games, which makes us feel very special. The song stays light in the verses, but really picks up in the pre-chorus and chorus, where vocal phrases are short and require precision to keep your multiplier up. Pre-chorus guitar has a HOPO-heavy line before going into big chords, and bass even has some back-and-forth HOPO action. This extra-large week is capped with another song from RWBY! Back at RTX, it was teased that wed be partnering up for more tracks, and Time To Say Goodbye is next up. Fittingly, its the OP to Volume 2 of RWBY, again by Jeff Williams ft. Casey Lee Williams. It's the perfect way to follow up the Rivals-exclusive This Will Be the Day, Volume 1s OP. Time To Say Goodbye comes in with a quiet intro sung by Casey, before breaking into heavy instrumentation across the board, rapid drums, unyielding bass, and a gnarly guitar riff. Everything shines past that, with guitar solos and riffs interspersed among basslines full of movement and quick drum fills to change sections. Of course, harmonies are crisp and frequent, so itll be a great time for everyone. If you thought This Will Be The Day was a good time, you should check out this follow-up. It also comes just in time for the debut of Volume 6, available to Rooster Teeth First members this last weekend and for everyone this coming Saturday! Play the song, watch the show, have a good weekend.